When it comes to Quality education, IIM Kashipur put its best practices to provide quality knowledge through a quality source. This was again proved by the 3 day Six Sigma Certification workshop organized at IIM Kashipur for the PGP ‘11 batch in partnership with Think Excellence Pvt. Ltd., specialized in lean six sigma training program. IIM Kashipur became one of the few b-schools to provide Green Belt Six Sigma certification to its students. The idea of the workshop cropped up when the student showed their interest in“Quality Management”. Under the leadership of Dr.Gautam Sinha, Director, IIM Kashipur, a number of actions have been taken for the realization of the vision. One such action is the collaboration with Think Excellence in order to give the best education to the student. Under this association, Six Sigma Green Belt workshop was held from 25th to 27th September 2012. “Quality education is our for-most priority and student should learn best in class methodologies and techniques” said K.N. Badhani, In-charge of Academics. Three day workshop was taken up by the Master Black Belt in Six Sigma, Aparna Thandavan who is also the director of Think Excellence. Aparna has 13 years of work experience in Industry and has done projects with various organizations such as Phillips, Bharti Retail etc. She has a vast experience in conducting training for corporate and education institutes. The workshop kicked off with the small game on process improvement. She tried to emphasize that process improvement is not a rocket science and quality can be improved if the end cause is identified before it affects the quality. The very structure of course was designed to give students the insights of what is meant by Six Sigma, how the quality can be managed, how to undertake a project, when to take up, various statistical methods etc. Workshop also explained the six sigma methodology which provides the technique and tools to improve the capabilities and reduce the defects in any process. “It was a great experience, the course learning’s can be applied in the assignments taken up while doing live project with the companies” said Kapish Saini, PGP second year student. “Just Tools and techniques can’t give you the improvement until it is used at the right place, and this workshop gave the structured approach on when to use and where to use these techniques in a project” said Kapil Vaish student of operations. The methodology student learnt is known as DMAIC- Define->Measure->Analyze->Improve->Control which is the structural methodology for six sigma projects undertaken at any organization. Student also accomplished three real life case studies on process improvement. PGP ‘11 student, Cobi Sarangal told that “This program will also help us once we enter the industry as it provides the methodology wherein we can streamline a running process in a company and generate value to the company, which is what makes Six Sigma even more useful”. Dinesh a student of operations also pointed out that “This program not only provides the structure, but also provides us tools and techniques which can be used in isolation under any standalone process”. At the end of the workshop student underwent through the evaluation process to secure their Green Belt Certification. On concluding note Aparna told “students showed great enthusiasm towards learning and their knowledge is at par with industry standards”. IIM Kashipur now boasts of 75 percent of the batch having Six Sigma green belt certification. 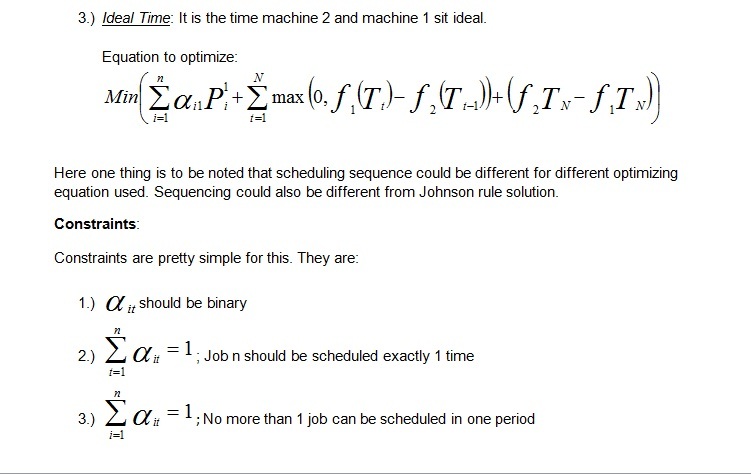 Johnson Rule as of 1954 is used for optimal solution for sequencing n jobs on two machines. Extended Johnson rule for more than two machines club the problem and make it two machine problem to again carry out same algorithm. 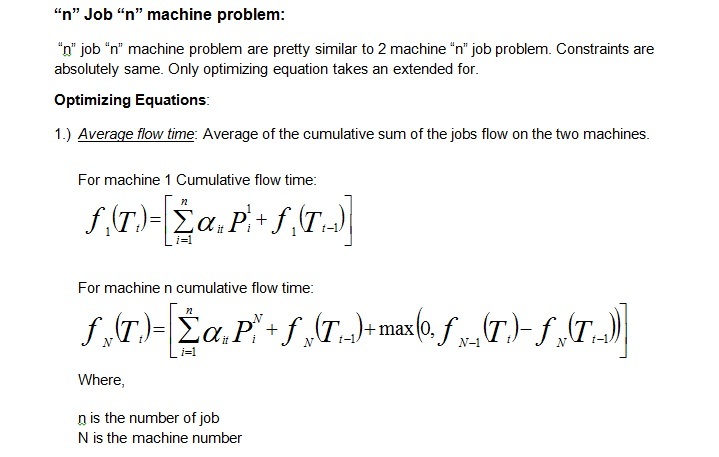 Johnson rule algorithm has a specified rule of allocation of job on machine. Least processing time job on first machine will go first in sequence, Least processing time job on second machine will go last in sequence and hence on. It looks easy for small no of job and only two machines but becomes time consuming and complex n jobs and n machine. Here I have attempt to develop a Mix integer linear programming model for Johnson rule and extended Johnson rule on more than two machines. In sequencing problem we can get the optimal solution by minimizing either of the below three attribute. Deciding which one to minimize is solely depends on the management i.e. on what they want to minimize. 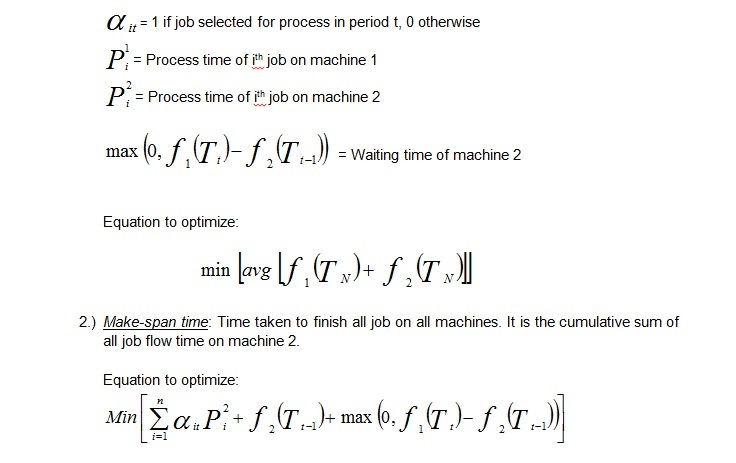 Here one thing is to be noted that scheduling sequence could be different for different optimizing equation used. Sequencing could also be different from Johnson rule solution. An excel example is attached with this article. I have taken a hypothetical example to illustrate how to use MILP for sequencing n job. Sheet 1 have an example of “n” Job on 2 machine and sheet 2 have an example of “n” job “n” machine sequencing. Hope you have enjoyed the article and gained out of it. Please feel free for any comment and clarification. In a vehicle routing algorithm you would have come across Clark’s algorithm at some point of time. It is a very effective tool to decide the vehicle routing when fleet size is infinite for us but carrier carrying the load is fixed. 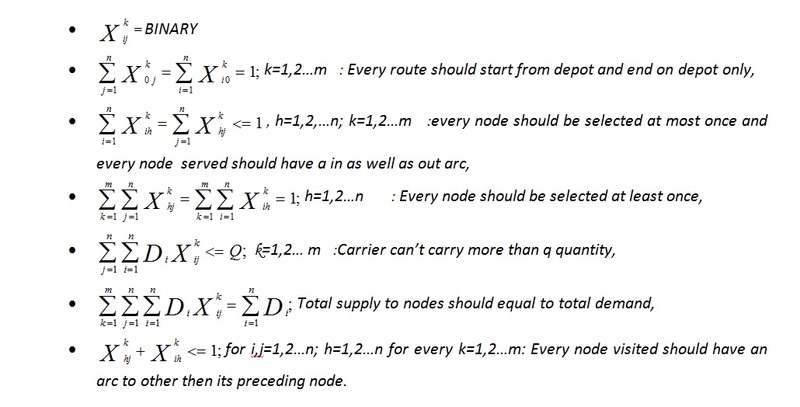 Algorithm uses the saving method to decide the optimal no of carriers and best possible combination of nodes to get the minimum cost (Distance traveled). I have attempt a mix integer linear programming model on vehicle routing algorithm. Let’s see how I formulated the model to get the optimal solution. I took help of the research paper by Francois Cote and Yves Potvin on “A tabu search heuristic for the vehicle routing problem with private fleet and common carrier” published in May 2007. A formulated model is given in the link below. Model is developed on a small problem with 6 nodes only. But it has a great potential to be applied on day to day companies vehicle routing decision. Hope excel attached would be very helpful for you. Sheet clark algo is the formulated model and sheet Practice is a practice exercise for you.